Whimsy Wood Thank goodness it’s Friday! Hurrah, hurroo, Friday is here for me and you! Thank goodness we’ve made it to the end of another week and the weekend is almost here!! 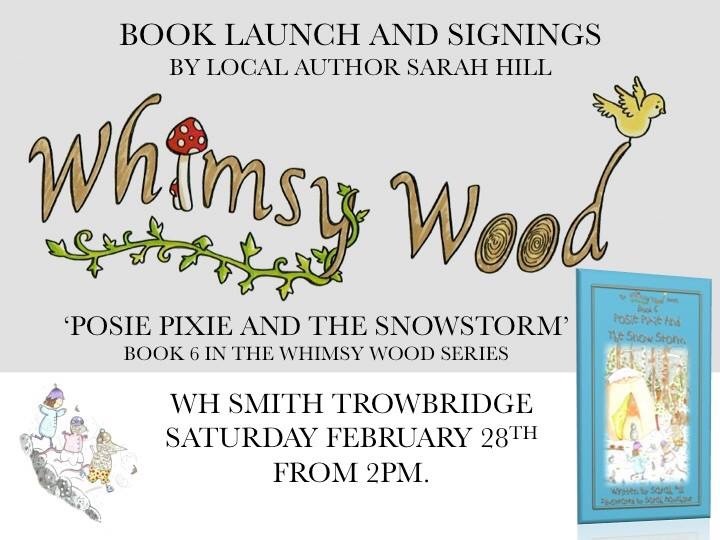 Which means that the launch of my sixth ‘Whimsy Wood’ book, ‘Posie Pixie And The Snowstorm’ is just over a week away! So to remind you about this exciting event, please see the flyer advertising this below. Flyer for the launch of book 6 at WHSmith, Trowbridge, 28/02/15 ? Now this book is written for the month of January, so there are sparkling snowdrops growing in ‘Whimsy Wood’, along with oyster mushrooms. Luckily, one or two are growing by Posie’s stone table in her kitchen and they make a sumptuous seat for a wee pixie, or indeed Posie’s best friend, ‘Wibble Woodlouse’! ‘Posie Pixie And The Snowstorm’, is the penultimate book in this first set of seven books in my ‘Whimsy Wood’ children’s series. Now I’m guessing you might want to know a little bit about the final book in this set?! Well, since it is Friday, I’ll let you into a few ‘Whimsy Wood’ secrets, as long as you promise not to tell a soul. Good. So calm yourselves….try to contain your excitement….drum-roll please!! Book 7, the final book about Posie’s adventures, is titled ‘Posie Pixie And The Pancakes’! It is of course written for the month of February (as each of my ‘Whimsy Wood’ books are written for a specific month in the calendar) and ‘Mrs Scarlet the Squirrel’, who runs ‘The Woodland Store’ returns in this story. You’ll also get to meet another of the woodland folk, ‘Dr. Tustle the Tawny Owl’, who’s terribly serious and one of the older members in the ‘Whimsy Wood’ community. 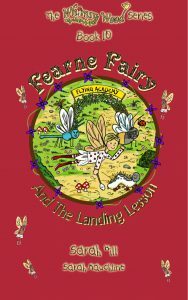 After book 7, we get to follow the amazing adventures of ‘Fearne Fairy’ in ‘Whimsy Wood’! For now, all I’ll tell you about Fearne, is that she’s not your typical fairy! Basically, like you and I, she’s far from perfect! ? ? Well, I’ve given away far too many secrets already, so before I spill anymore, I’d best away and bid you a wonderfully whimsical weekend! In the meantime, if you wish to take a sneaky peek at book 6, ‘Posie Pixie And The Snowstorm’, before it’s launched next Saturday, then please feel free to click on the link below ? Sarah Hill, children’s author and creator of ‘The Whimsy Wood Series’.